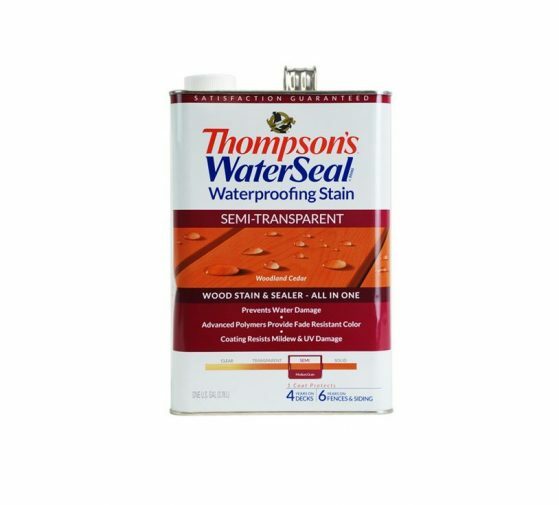 Thompson’s Waterproofing penetrating oil stain that enhances the natural beauty of wood by adding fade resistant beautiful color that allows the wood grain and texture to show through. 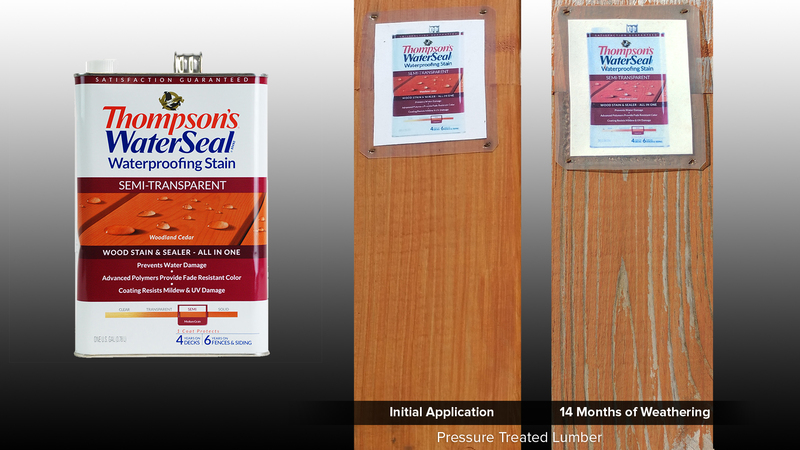 Thompson’s Waterproofing Stain also resists UV damage. This product looks like pink paint. Even when applying, it still looks slightly pink tinted. Though it held its color pretty well, the peeling that we saw, in our 14 moth weathering test, was severe. To learn more about the top stains on the market, view our Ranking & Reviews. I have used this brand of thing many times and has never failed me or let me down. It has always performed above beyond my expectations and made what I was doing look great. Thanks for a great product. + PROS: Again this product makes my jobs look professional and I will always use this product. I'm getting ready to make to build a porch swing for my wife and I will be using this product again. I Guess like many first time home owners, I wanted to do the best I could, so I chose Thompson’s for an initial deck treatment. I brushed it on according to the instructions and it was easily penetrated but time consuming. I was really pleased with the finish. It held up well the first and second year. Third year, not so, but I understand that it is normal. I am hoping to find a longer lasting solution. What’s the Best Deck Stain to Use? Wood Deck: Should I Stain or Paint? Deck Stain Pro is a resource site for deck owners looking for the best deck stains on the market. As a full disclaimer, this site was created by the makers of DEFY Wood Stain. We manufacture DEFY to be the best water-based deck stain on the market, and to prove it, we showcase how our products perform over time, and compare them to the top brands. Rather than tell you how good DEFY is, we go a step beyond that to actually show you how well it performs with deck stain weathering videos showing performance over time.